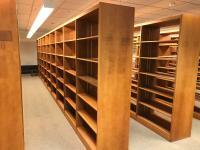 Available for free, adjustable wooden shelving from UVM's Howe Library. These are currently set up in 9 section rows with 6, three foot shelves per face. 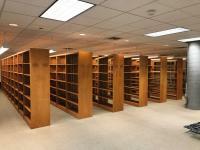 The total capacity of all of the shelving is 2,790 linear feet. These can be configured to any length you want. Each section is 3' and can be added onto the first.